Governor Jared Polis unveils legislation to offer full-day kindergarten to all around the state of Colorado. The Joint Budget Committee set aside $185 million in General Fund. 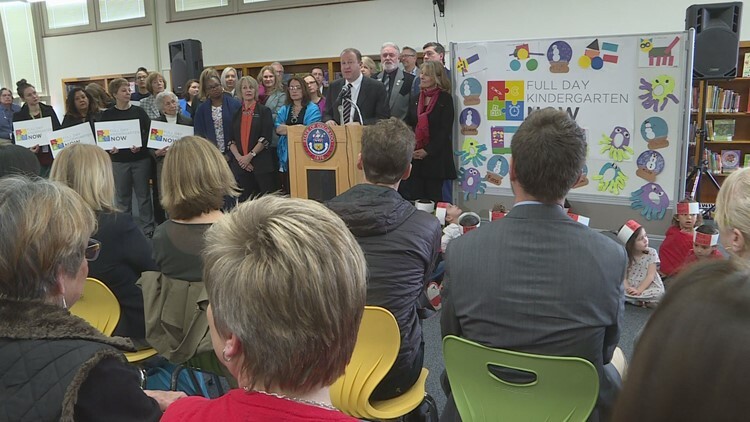 DENVER — Armed with a $185 million nod from the Joint Budget Committee, Governor Jared Polis released legislation to offer full-day kindergarten to all students across the state. "The key aspect is that every child, no matter where they live, no matter the wealth of their parents, no matter their race, deserves a strong start," Polis said. The plan would take effect next fall. It was first suggested in a failed bill last year by Republican Representative Jim Wilson from Salida and Representative Barbara McLachlan, a Democrat from Durango. "This is what all of Colorado should be looking at is these kids to say what can we do for them to make their lives better and to make their future better and this is the bill that will do it," McLachlan said. Wilson said this plan will save money for parents and school districts while adding 5,000 more free preschool slots around the state. "The kindergarten train is coming folks," Wilson said. "You've got one of three options. You can jump on board. You can jump out of the way. Or, you can get run over because we're coming." Polis said this plan will allow districts to make their own adjustments towards full-day kindergarten, but he said with this bill, the money will be there. "All too often, we hear about unfunded mandates, which they are very frustrating for people in the field who have to deliver on them," Polis said. "This is the opposite. This is a funded, non-mandate. So, how about a funded, non-mandate for a change?" Opponents at the Capitol see this is a directive of change from the top. "We're trying to say one-size-fits-all, that full-day K is best for every single student, and I disagree," said Rep. Kim Ransom (R-Douglas County). Ransom was the sole vote against the allocation of $185 million from the General Fund towards funding full-day kindergarten in every district in the state during the Joint Budget Committee. "For us to take new obligations that will last and not know exactly where the money will come from, I think is something that we should all look twice at," Ransom said. She said she believes that if any change were to come to the current kindergarten system, these should be decisions made by local school boards, not state politicians. "I want local school districts to be making decisions for their schools," Ransom said.